As I mentioned before, Hannah Dowis began giving birth to her family in 1891 at about the age of 16 years. She kept at that job for 27 years, ending with the birth and death of an infant son 27 October 1918. The first child to pass away was Susie Dowis, who was just days old, in 1894. More than 100 years later, the last child of Hannah's to reach adulthood would breathe her last breath. 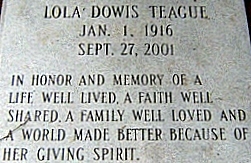 Lola Dowis Teague was born 1 January 1916, and she died 27 September 2001. Her final resting place is next to her husband in Memory Hill Cemetery at Milledgeville, Baldwin County, Georgia. Lola's obituary was carried in the Macon Telegraph as well as the Atlanta Journal Constitution. She died in Macon at the age of 85. She was a native of Gwinnett County, but had lived in Milledgeville for many years. Her husband was the late James D. Teague, Jr. Lola was a retired Health & Physical Education teacher with Baldwin County High School. She also coached girls basketball. Mrs. Teague was also a Girl Scout troop leader for many years. She was heavily involved with Hospice, the American Red Cross, and the American Cancer Society. She followed the Methodist faith. Lola Dowis Teague left behind a son, 3 daughters, 14 grandchildren, and 15 great-grandchildren. Her legacy lives on.